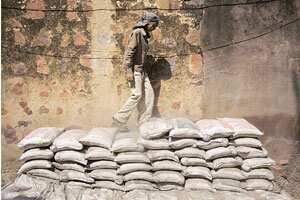 Ethics scanner: A labourer walks on a pile of cement bags at a building site in Gurgaon. The commission has also investigated the role of trade body Cement Manufacturers Association in fixing prices. The Monopolies and Restrictive Trade Practices Commission (MRTPC) on Thursday ruled that the cement industry was involved in restrictive trade practices and ordered an end to fixing prices in concert, 17 years after it began its inquiry into the industry. The inquiry into possible cartelization was directed at 44 cement companies, including top cement makers Ambuja Cements Ltd, ACC Cements Ltd, India Cements Ltd, Madras Cements Ltd, Shree Cement Ltd and Dalmia Cement Ltd. It also investigated the role of trade body Cement Manufacturers Association (CMA) in fixing prices. “...All the respondents excepting (CMA)...have been indulging in restrictive trade practices and have been acting concertedly," MRTPC said in its order. The commission began inquiries on 12 October 1990 into possible cartelization by cement companies after its investigative wing argued that the firms were setting cement prices “in an arbitrary and unjustified manner". Despite differing costs of production in different units in the same region, prices of different firms were the same, the investigative wing had said. The commission directed 41 of the 44 firms not to fix prices in concert and asked these firms to comply with the order within two months. CMA said it had not yet seen the order. “At this stage I can only say that we respect the judgement of the court and will abide by it," CMA president Hari Mohan Bangur, who is also the managing director of Shree Cement, said. Some of the indicted firms no longer exist, he added. Analysts said the judgement will have little impact on the stock prices of the cement firms and also on future price hikes. New Delhi: India will receive a grant of more than $100 million (Rs396 crore) from Geneva, Switzerland-based funding agency Global Fund for AIDS, tuberculosis and malaria. The amount will be used to buy costly second line regimen of anti-AIDS drugs and scale up existing antiretroviral treatment (ART) programmes in the country. India has an HIV-infected population of 2.5 million people of which roughly 500,000 could be requiring ART. The government is providing these drugs to merely 130,000 infected people as of now. “This is a very positive news for India’s fight against AIDS and these resources could be put to use in furthering that cause," Union minister for health and family welfare Anbumani Ramadoss said while addressing the media in New Delhi. Global Fund’s total grants portfolio for India is $747 million for treating the three pandemic diseases of which $492 million has already been signed on, said Global Fund’s executive director Michel Kazatchkine. New Delhi: The Director General of Civil Aviation (DGCA) has issued show cause notices to Kingfisher Airlines Ltd and Jet Airways (India) Ltd for not complying with ticketing norms relating to charges on tickets. In an emailed statement DGCA said it has issued notices to the two airlines “asking them as to why action should not be initiated against them under paragraph 15 of Schedule XI of the Aircraft Rules, 1937, for not furnishing the details of the charged tax components in their domestic airline tickets, as this was in violation of the conditions...to operate Scheduled Air Transport Services." Most airlines have been clubbing surcharges levied on rising fuel costs and fuel burnt due to congestion over airports—amounting to as much as Rs1,800 per passenger—and classifying it as taxes on tickets creating “ambiguity".